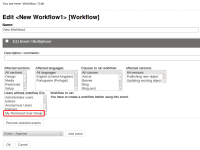 When adding a multiplexer event to a workflow, user groups that have been moved to trash are still shown in the "Users without workflow IDs" list. You will be able to find your removed user group in the "Users without workflow IDs" list. Check the attached screenshot for example. Pedro Resende (Inactive) added a comment - 28/Jan/14 12:17 PM Tested and approved by Q.A.